A great glass set to complete your kitchen! 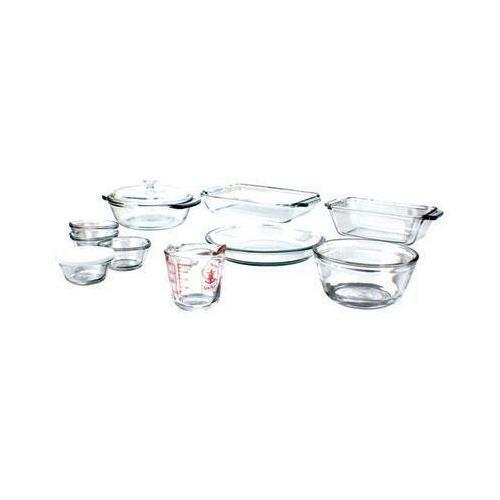 If you like to cook in transparent glass cookware because you can see what is baking from all sides, then choose this Anchor Hocking 15-Piece Baking Set. Containing a nice variety of pieces, your choice of recipes to use is endless. Strong, durable, with tab handles on the casserole and bake dishes, this set is serviceable and should last for a long time. Glass pie plates will nicely brown the bottom crust of your favorite pies. Prepare the quick breads your family loves in the oblong baking dishes. And an extra measuring cup in your kitchen is a plus! Transparent glass Allows viewing of cooking food from all sides. Variety of sizes Permits using a wide assortment of recipes requiring different sized pans. Tabbed handles Offer easy gripping and removing from hot oven. Custard cups with lids Can be covered for storing puddings and custards or leftovers in the refrigerator. Measuring cup Has distinct measurement markings on the sides for accurate work.